One of the more interesting mysteries I have seen in recent sports titles is people trying to figure out how to get the final Jackson Ellis cut-scene on NBA 2K15 ‘My Player’ mode. All sorts of videos of people saying ‘THIS is the truth and other people are liars.” are just about as helpful as those that are liars. Without further delay – here are some of the facts surrounding My Player and where he was in his career upon getting the Jackson Ellis scene. One this is certainly true – playing the games and not simming them is going to be your best bet. I simmed quite a few games in my first couple seasons and while I say I regret it from the ‘shoe deal’ perspective. It actually made it so that my player has realistic career averages compared to what I have now in my third full season in the NBA. First and foremost – I am convinced that maxing out at least one attribute is key. 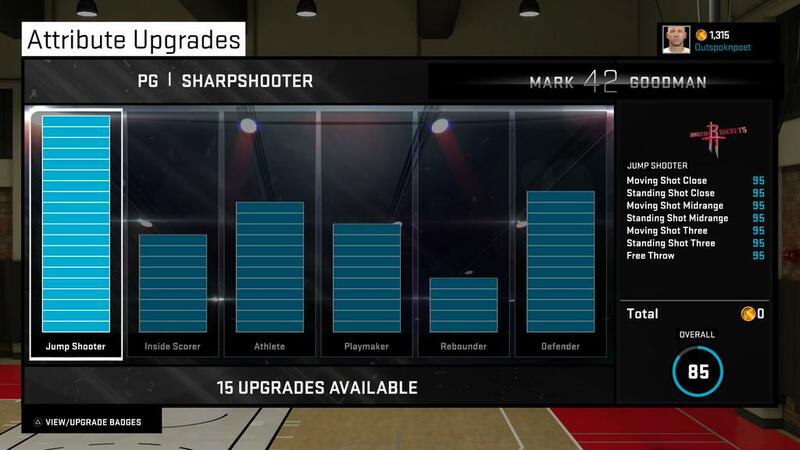 I don’t know if it was simply some sort of coincidence, but after playing the first 9 games of the 2017-2018 season I finally got earned enough VC to get the final upgrade for jump shooting. My attributes just before/after the final meet up with Jackson Ellis. I believe you either need to have a single attribute fully upgraded or have used a certain amount of upgrades. 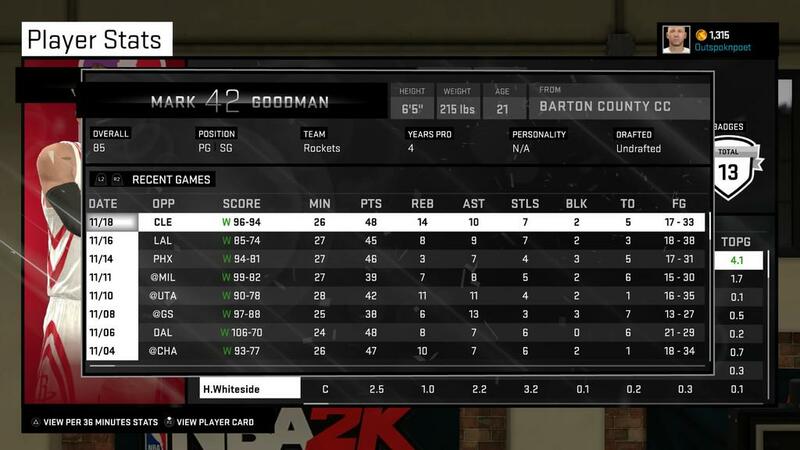 I nearly had a quadruple double in the 10th game of the season. The game I got the Jackson Ellis scene from was also a great personal performance where I almost had a quadruple-double. I don’t believe a Triple-Double or Double-Double count matters so much, but It was my 15th career Triple-Double just in case that does matter. My Last 10 Games before Jackson Ellis stopped by. I am currently playing 8 minute quarters and using the casual setting. Does this take away from ‘sim play’? Sure it does. However, it also keeps me from playing insanely long games with frustratingly bad teammates and such. It is just more fun for me. 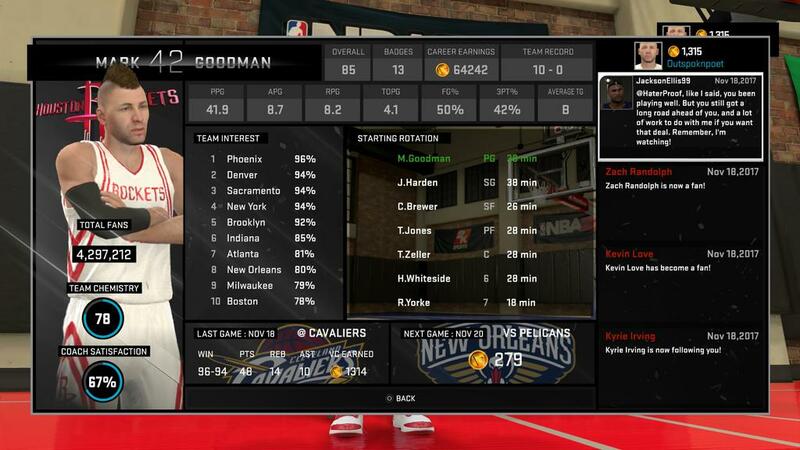 I did notice that I averaged over 40 points per game and had sporadic Double-Double/Triple-Double performances. Finally – I had 92 Games Played. I believe some of these played games are a bit skewed as I certainly started at least 10 games and simmed to the end once they started. You can look at the actual ‘games played’ by you by going to the Milestones Career Section and scrolling to towards the bottom. Take a look at the ‘games played’ achievements and you will see how many you have actually played – not simmed. I hope this has helped you put together a few more ideas about how to get the ‘Wooo!’ scene with Jackson Ellis. It will take you two more games for him to visit your house and seal the deal. For me, it was quite awesome as the game after I picked Jordan as my endorsement I got a quadruple double AND the ‘I Got This’ trophy. Then, I somehow had a more impressive shot a game or two later.